Ballymena United made it 19 games unbeaten as they saw off Newry City 3-1 in the Danske Bank Premiership at the Showgrounds. Second half goals from Cather Friel, Ryan Mayse and Adam Lecky sealed the three points for the Sky Blues and that result means they stay top of the table after seeing off a determined Newry outfit. United had the first real chance of the match in the 16th minute. A Steven McCullough corner was cleared by the Newry defence to United's Ryan Mayse who had his volley well gathered by Newry keeper Steven Maguire. Both sides were still trying to settle but the home side were starting to turn the screw with Jude Winchester lively in their midfield but Newry were well organised and proving hard to breakdown. United had a good move in the 28th minute as Jonathan McMurray and Cather Friel combined before Winchester's shot was deflected wide. A minute later the Sky Blues had another chance but Mayse's shot was saved by Maguire and the chance was lost. Newry's Stephen Teggart tried his luck from long range in the 36th minute which returning United keeper Glendinning did well to push away. Seconds later Teggart tried his luck again. This time is effort was just off target. In the 40th minute Newry had another chance as Stefan Lavery hit his shot off target as the visitors picked up the pace in the final few minutes of the first half. In the 43rd minute United should have been 1-0 up. Shane McGinty made ground down the right before firing a pass across the box. it fell to Friel and he blazed over when he should have scored. Hopefully United will not regret that miss? One minute from the break Mayse hit the bar with Newry keeper Maguire beaten as United pushed for the opener. In the 54th minute United had the first chance of the second half. Defender Jonathan Addis went on a run before having a shot. His effort however was well saved by Maguire. The Newry keeper had no chance a minute later as it was 1-0 to the home side. A ball found Winchester in the box. He fluffed his chance but it fell to Friel who fired home his 12th goal of the season. Newry's Thomas McCann tried his luck in the 61st minute to get his side back in the game with a long range shot. It however was easily gathered by keeper Glendinning in the United goal. It was 1-1 in the 64th minute. Poor defending by the home side resulted in Mark McCabe firing home through the legs of Glendinning from a pass by Tiarnan Rushe. It was 2-1 in the 67th to the home side. A great run down the right by Kofi Balmer resulted in his ball being slammed home by Mayse from close range for the former Dungannon Swifts players fifth goal of the season. Newry's day got worse in the 68th minute as captain Declan Carville was sent-off after picking up his second yellow card of the afternoon for a foul on Winchester. Then seconds after that Newry striker Mark McCabe had to be taken off and replaced by Conall Delaney after picking up an injury. On 74 minutes United skipper Jim Ervin put McMurray through and his lob beat keeper Maguire but not the bar. The striker was inches away from making it 3-1. 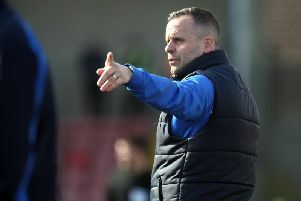 United's Winchester tried his luck with ten minutes left but he was denied by a flying save from Maguire in the Newry goal. It was 3-1 in the 81st minute as a McCullough corner found the head of Adam Lecky and he headed home at the front post and the league leaders looked home and dry. Subs not used: McDermott, Quigley, Whiteside. Newry: Maguire, Noonan (Mullen 90mins), Boyle, McCann, Carville, McCabe (Delaney 72mins), Lavery, Rushe (88mins), Teggart, Montgomery, Healy. Subs not used: Hunter, Hughes.